Mediterranean Energy Perspectives 2008 assesses the energy outlook for Mediterranean energy markets through 2030. This publication was prepared by the Observatoire Méditerranéen de l’Energie (OME). 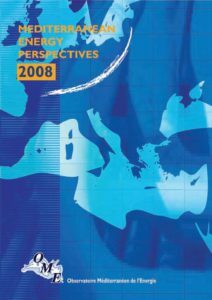 MEP 2008 provides an in-depth analysis of projections for 24 Mediterranean countries and aggregates. – Systematic and comparable country tables presenting energy demand to 2030. MEP 2008 is the first annual issue of a regular publication whose aim is to compile and present the extensive work of the OME. This edition of MEP is based on an exclusive in-house model that brings to light alternative, nongovernmental view of how energy demand might evolve in the Mediterranean countries. Because its forecasts can be easily compared with those available elsewhere, MEP will be an indispensable source for policymakers, researchers, and members of the business community.